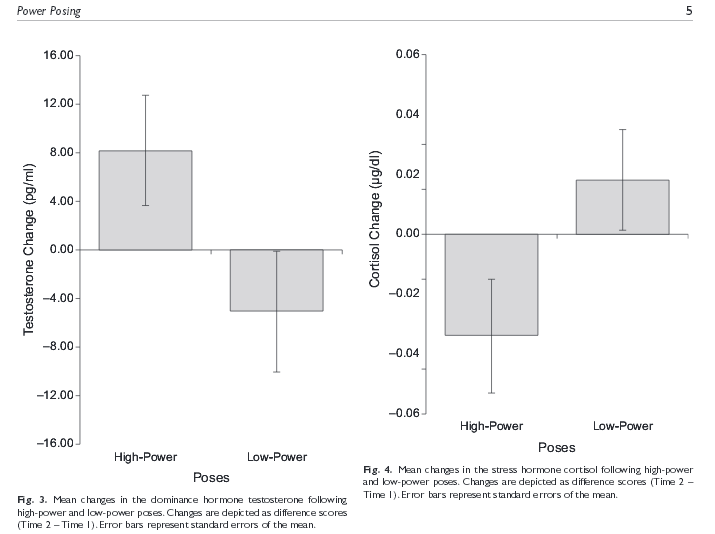 Experiments show that adopting either a high or low power body posture for just 2 minutes changes: how people feel about themselves, their willingness to take risks and their testosterone and cortisol levels (relative to samples taken a few minutes beforehand). Those adopting a high power pose show a 20% rise in testosterone and a 25% drop in cortisol (stress hormone). Those adopting a low power pose show a 10% drop in testosterone and a 15% increase in cortisol. On a practical level, this has been shown to effect how they perform in follow-up tasks requiring poise and confidence, e.g. a job interview. It is yet another example of how our bodies inform our thinking, feelings and subsequent behaviour. I wonder whether such findings could be used to address the problem of sports players whose “heads drop” (commentator speak) when their opponents score a goal or a try or hit a boundary in cricket. This physical reaction makes it more likely that the scoring side will score again in short order and, indeed, this often appears to happen. Scoring players typically raise their arms, look skywards, pump their fists and bang their chests. We recognise this as expressing how the score makes them feel. But we don’t necessarily recognise that the very adoption of such a posture (whether they had scored or not) automatically raises their testosterone level, lowers their cortisol which increases their confidence, their willingness to take risks and their aggression levels. This combination makes it much more likely they will score again in the next few minutes. Conversely, the ‘scored-against’ players drop their heads, put their heads in their hands and even drop to their knees. Again we recognise that these defeatist postures reflect the pain and disappointment they feel at that moment but, unfortunately, the very adoption of those ‘low power’ postures has a direct effect on their testosterone and cortisol levels affecting a decrease in confidence and aggression and making them anxious about taking any risks. This puts them at a significant disadvantage for the next few minutes of play. So, what could be different? It would be challenging to implement but maybe players could be instructed, when they have just been scored against to force themselves to mimic (i.e. fake) the bodily postures of their opponents, i.e. lift up their heads, throw their hands in the air and pump their fists. At the very least, this should confuse the opposition (and the crowd! ), but if the theory works, then the players won’t experience the same “heads down” drop in testosterone or rise in cortisol and they may hopefully even experience their body chemistry going the right way simply as a response to their “artificial” bodily postures. In theory, that would create a “more level playing field” (as the commentators would say) for the critical next phase of play. It would at least be fun to try the experiment and certainly it would shock the commentators out of their usual set of clichés as they attempted to explain what they saw on the pitch! This entry was posted in Uncategorized and tagged cortisone, neuropsychology, power pose, rugby try, testosterone. Bookmark the permalink.